The EURACTIV Network, a combination of independent and integrated offices, is present in 12 EU capitals and provides free localised EU policy news in 12 languages, reaching almost one million readers across Europe and beyond, every month. 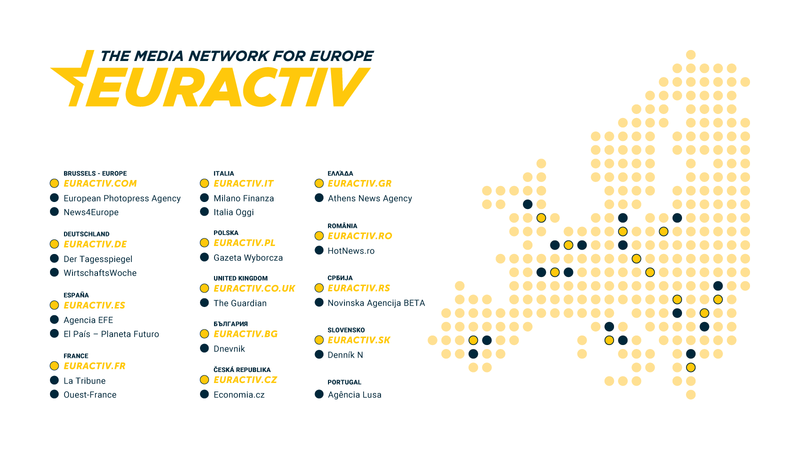 The EURACTIV Network partners produce content in Brussels (Belgium), Bulgaria, the Czech Republic, France, Germany, Greece, Italy, Poland, Romania, Serbia, Slovakia and Spain – reaching over 80% of EU citizens in their native language. The EURACTIV Network partners complement the ‘Brussels perspective’ on EU news and policy debates with national angles and localise the coverage to the interests and needs of our readers. Today, media moves within a global village. Sharing content across borders has become part of our daily news consumption. EURACTIV has internalised this concept from the very start, and is now expanding its outreach to mainstream media. These agreements are an important part of our strategy to deliver the best EU journalism possible. Portuguese news agency (LUSA) and Athens News Agency – Macedonian Press Agency (ANA-MPA) are the latest media to sign content sharing agreements with EURACTIV, the media network for Europe. LUSA and ANA-MPA join Spanish news Agencia EFE, as EURACTIV Network partners and fellow members of the European Pressphoto Agency (EPA) with whom EURACTIV also shares multimedia content through EPA’s News4Europe.eu platform; and together with Poland’s Gazeta Wyborcza, Italy’s Class Editori (Italia Oggi, Milano Finanza), Germany’s Der Tagesspiegel and Wirtschaftswoche, France’s La Tribune and Ouest-France, and The Guardian in the UK, the EURACTIV network media partners reach over 20 million readers across Europe. We are committed to expanding the breadth and depth of our coverage even further with similar deals – so watch this space. Cross-Lingual and trans-national co-operation involving both euractiv.com and its partners proves the success of the Network in communicating Europe to policy professionals, especially to national administrators, opinion makers and other multipliers. Notre chance de vivre dans notre vieux continent au sein de l’UE. Peuples populations ne laissez pas passer ce privilège. Des grands défis nous attendent et je veux bien le croire que c’est ensemble que nous pourrions y arriver. Place à tous nos concitoyens qui veulent voir l’évolution de l’Europe. Ne laissez pas de place pour ceux qui veulent voir sa déchéance. This is entirely nonsense – no original research, no facts, just speculation. The UK will continue to be the no.1 market for many of Europe’s best goods: Danish bacon, French wine, Dutch flowers, Albanian gangsters, and London will continue to dominate all of the EU, without any possible rival whatsoever. The UK will still suffer a big £10bn trade deficit with the EU. Austria, for example, buys almost nothing from the UK. Macedonia almost buys more than Austria, a very closed, protectionist market in all sectors – just like France and Germany. A clean break Brexit is just what the UK needs to get away from the near-dead economies of Europe. Malta won’t suffer – it’s stuffed with tax-free gaming companies!